Endorsing BJP Manifesto prima facie, Shiv Sena keeps option open to revolt if issues of Ram Temple and Art. 370 are not addressed properly within six months after BJP comes to power in 2019. But, now to fight jointly to make PM Modi and NDA victorious with large margin. Upendra Bharti | HENB | Mumbai | Apr 10, 2019:: Days after the Bharatiya Janata Party (BJP) released its election manifesto, the Shiv Sena on Wednesday fully endorsed BJP’s ‘Sankalp Patra’ (Lok Sabha Election Manifesto 2019) by giving it “200 out of 100 marks” for incorporating all their long-held demands, including the construction of Ram Temple in Ayodhya, abrogation of Article 370, and welfare of the farmers. 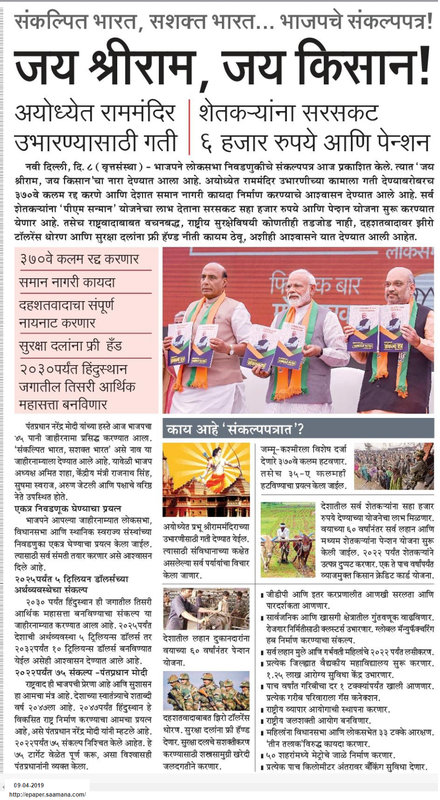 On Tuesday the Shiv Sena Paper highlighted the salient features of BJP 2019 Loksabha manifesto in its first page with much importance. Endorsing the BJP line in the manifesto, Shiv Sena stressed in its editorial that the Centre must take substantial steps to strike down Article 370 and pay homage to the people who sacrificed their lives for the same. “If Prime Minister Narendra Modi and Amit Shah really want to fulfil the dreams of the people struggling for independence then they must first abrogate Article 370. It is because of this article that the rules and regulations imposed in other states in India cannot be implemented in the state of Jammu and Kashmir,” the Shiv Sena mouthpiece said. The BJP on April 8 had promised to strike down Article 370 of the Constitution while releasing its manifesto. “We reiterate our position since the time of the Jan Sangh to the abrogation of Article 370,” read the manifesto. The manifesto added that in the last five years, the Centre had made “all necessary efforts” to ensure peace in Jammu and Kashmir through decisive actions and firm policy. The Shiv Sena editorial also slammed former Jammu and Kashmir Chief Minister Farooq Abdullah for daring the BJP-led government to “even touch” articles 370 and 35A of the Constitution. “Dr Abdullah has now threatened the government for touching article 370 of the Indian Constitution. The tongue of such a person should be cut. If they (BJP) really want to pay homage to people such as Syama Prasad Mukherjee who have sacrificed his life over Article 370, then the party must abrogate this article. As per the manifesto, this article should be scrapped,” it added. Expert on Hindutva Politics, Upananda Brahmachari told HENB that. “maintaining the politics of alliance, Shiv Sena prima facie endorsed the important and common aspiration of Hindu voters of India on Ayodhya Ram Temple and Art. 370 as reflected in BJP 2019 manifesto. But, it will be a harder task to advance for Ram Temple or Art. 370, if BJP and NDA emerge with less seats in next parliament than now”. This entry was posted on April 10, 2019 by hinduexistence in Ayodhya Ram Janmabhoomi Temple Movement, Demand for Ram Temple at Ayodhya, Hindu Demand for Ayodhya Ram Temple, Hindu Existence, Hindu Politics, Ram Janmabhoomi Temple Movement, Scrap Art 370 from Indian Constitution and tagged BJP 'Sankalp Patra' Manifesto 2019, Farooq Abdullah, Narendra Modi and BJP, Narendra Modi and NDA, Saamna, Shiv Sena endorses BJP manifesto on Art 370, Shiv Sena endorses BJP manifesto on Ram temple, Shiv Sena keeps option open, Upananda Brahmachari.